I love these! Will be making them with my preschoolers. I saw your post via craft gawker. I have JUST made these for my valentine’s swap cards, put them out to dry, and logged on here to find… this! The only difference is that I used a cookie cutter to shape my hearts. Works nicely. A cookie cutter is a great idea! I will have to try that for stars at Christmas! Thanks! There now, THIS is what the leopard yarn was destined for. I knew you’d come up with something. ooooh I love this! yes, don’t learn to knit. I finally did about a month ago and it monopolizes all my time even though all I can make are scarves and ugly hats. Ahhh – but knitting is cathartic – and is cheaper than any therapy you will find! 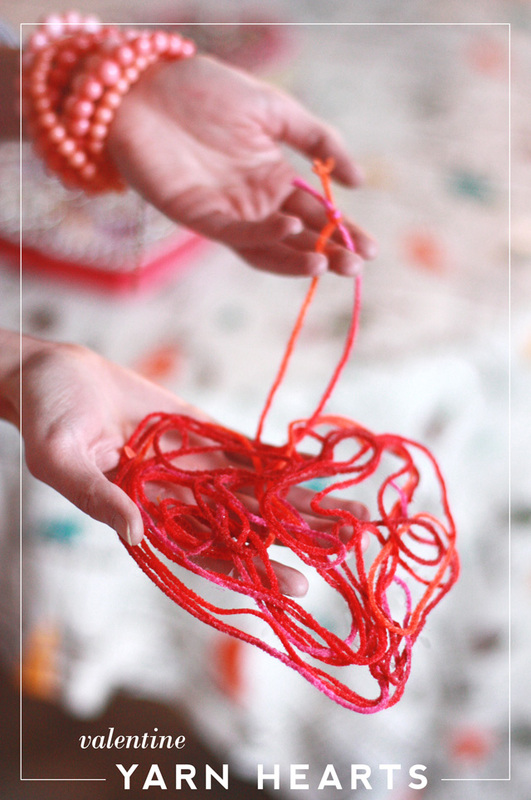 I’m so doing this project with the girls – I think they will love it! If you decide to give (awesome, soothing, meditative) knitting another chance, use BAMBOO needles- they hold the yarn for you, so you can just concentrate on making the stitches. & btw, crocheting is harder than knitting! i’m so happy to have found your blog! we’ve had a blizzard here this weekend and i’ve spent just about the whole weekend poking around, getting inspired, laughing, and crying. i’ve even emailed links to a few posts to my mum. so, thank you! I just love them! 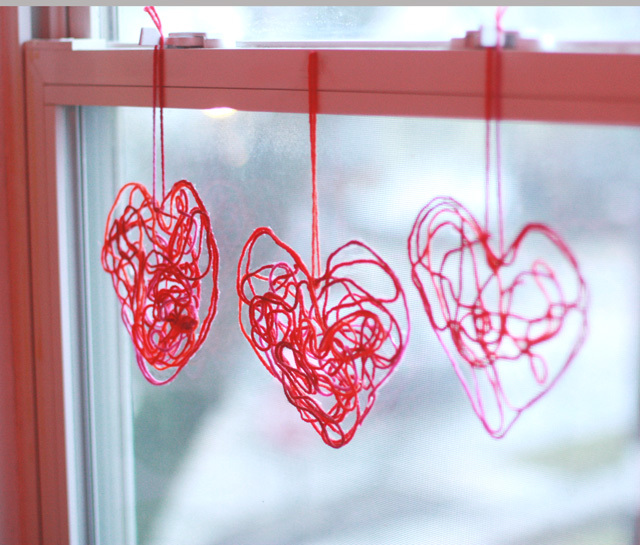 Will try them to decorate my classroom for Valentine´s this year. Thanks!! These are super duper fun! Yeah there are things that I just can’t do and I find other things to use pretty yarn on. I did want to knit stupid stuff for my animals as well and ahem one of them already pees on things sometimes so I don’t wanna tempt the other ones. how many hearts can you make with one bottle of glue? 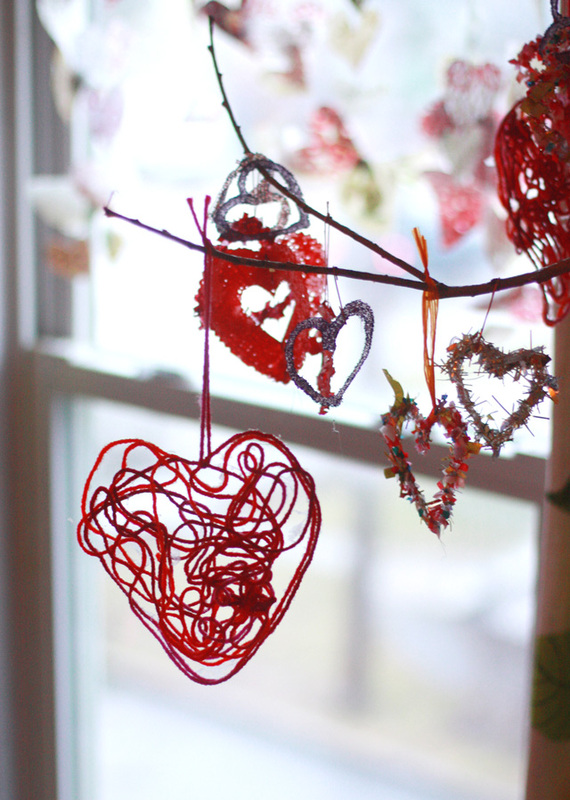 It depends on the size of the hearts and how absorbent the yarn is (natural fibers will absorb more). My guess is at least 30. These turned out great. I have a 5 year old grandson with a very short attention span. A lot of crafts we do he starts and Nanna finishes. Well we made 6 hearts and he worked on them from start to finish. 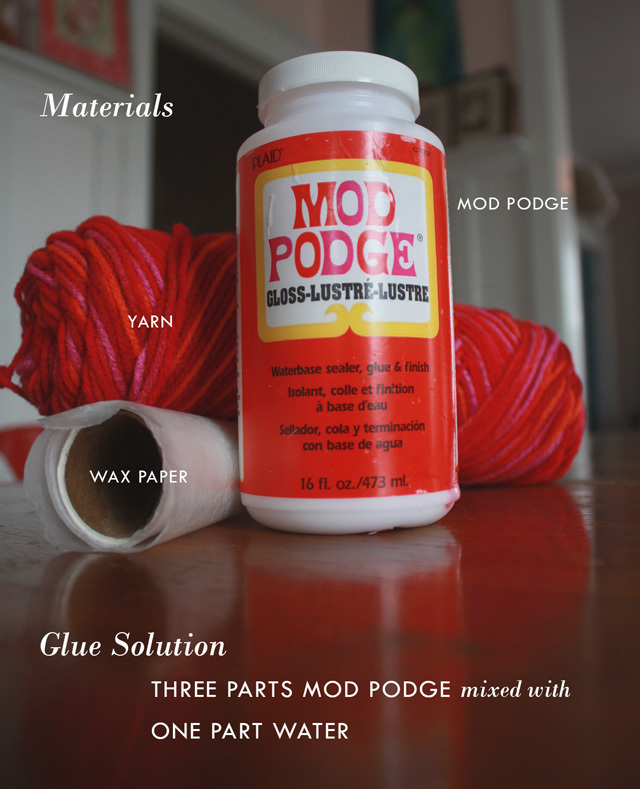 The only thing I did was squeeze out the glue from the yarn. We turned it into a mobile using 1/2 of an embroidery hoop I had in the closet. I have a 2 year old grandson also. Easter is right around the corner, so we’ll try doing eggs and maybe butterflies too. Thanks for the how-to. Glad to hear it, Mary! Easter eggs are a great idea!